December | 2011 | E-verything! Well it’s that time of year again and this recorded, session is of the fourth “End-of-year/Christmas” party that we have held online as part of the webinar series! Will we still be here next year? Each year when we do this I wonder if the webinars will still be happening for the following “end-of-year”. Perhaps it is time to change the way we do this? When we started webinars were rare and indeed we didn’t even call them webinars at the start! People still come to Serendipity and Fine Focus but there are fewer than in the early days. I feel/hope this is because there are now so many free webinars available and not because we have become boring! 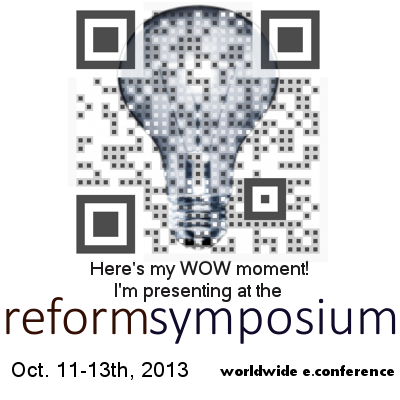 These webinars have always been relatively informal with an emphasis on participation, sharing and interactivity. They have been the “first” interactive webinar experience for many, and also for many the first opportunity to present in a webinar. For the moment we are still here – at least for the start of – next year, but whether this was our last “End-of-year” party only time will tell. For these “party sessions we encourage people to bring along “virtual” food – an image of food they particularly like – and share this on the “table”. This year we had a whiteboard to share whether we have a holiday at this time of year, and if we do then what is it called and how do we celebrate it. The main part of the session is focussed around playing online, interactive, party games. The purpose is not entirely frivolous as they can often be adapted to use in student learning. Interactive games in BbC also serve to illustrate the potential for active participation/ engagement that is so often not used to its full extent in virtual rooms. We had four games to play. 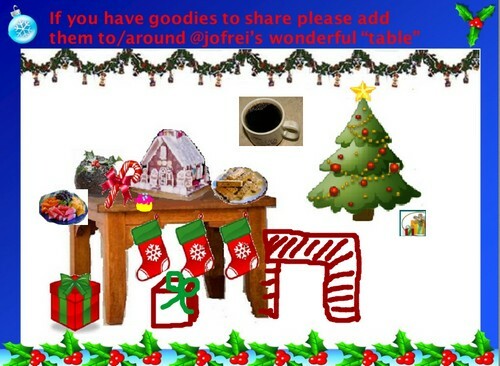 The first one (from @jofrei) pushed the boundaries a bit as her “Guess the Gift” was an App Share of a running Powerpoint – not for the fainthearted or low bandwidth! Our second game was from @philhart and invited us to “rewrite” parts of “The 12 Days of Christmas” from an e-ducator perspective – this generated some interesting ideas! The third game was a “CrissCross” puzzle with a combination of Christmas and Web2.0 clues – this was one I generated using the Discovery Education website CrissCross grid creator – this and their other puzzle generators are a great resource. The fourth game was from @tracywatanabe who got us playing “Find the Fib” – each of us putting up four statements about ourselves 3 truthful and one lie. The others then guess the lie. This has huge potential for use with students where you could ask for 3 true and one false piece of subject knowledge. 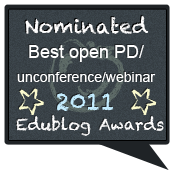 Our next session will be an Edublogs “Serendipity” session on Thursday January 5th 2012 at 23:00 GMT/UTC (Afternoon/Evening USA) or Friday January 6th 2012 at 7am West Aus, mid morning Eastern States Aus depending on your timezone (check yours here) – in the usual BlackboardCollaborate room. This is one of our fortnightly unconference sessions where we invite you to bring along your “hot topics” and “burning issues” for our poll on the topic. Edublogs Serendipity webinar overview – End of year activities! Stop Press – last two days of voting #eddies! We have been shortlisted for the Edublogs awards Thank you so much if you nominated us. And thank you also if you are voting for us. ONLY TWO DAYS TO GO – deadline 11:59pm US EST Tuesday 13th December. That’s the early hours of Wednesday morning in Europe and late morning/early afternoon Wednesday here in Australia if you would like to vote for us (Serendipity/FineFocus Webinars in Edublogs award)s click HERE to go to the site, see nominations and cast your vote. We invite you to our End of Year/Christmas Party on 15th/16th December – come along with virtual “goodies” for the festive table, and if you feel inventive bring a game to share and play. Take a look at the overviews for our parties in 2009 and 2010 to see the sorts of things we do. After the party the webinars will be taking a two week break returning on 5th/6th January with the first Serendipity session of 2012! Apologies for the delay in posting – despite starting leave at the end of Friday I have been finishing off a variety of work “loose ends” over the weekend. My holiday begins appropriately with this post. We had a fun session – very Serendipitous and, as always, recorded (though I was a bit late starting the recording – I don’t seem to get a recording reminder in BbC11 as I did in Elluminate10) so you can catch up on what we did it if you missed it! We started as usual by putting our topic ideas on the whiteboard and then polling to choose the topic for consideration. The winner was “End of year activities”. Once the topic was chosen we used a whiteboard to collect some of our ideas and thoughts on this including some links. As usual ideas were also shared via text chat and audio. There were many ideas with Christmas themes around the 12 days of Christmas and collaborative activities such as drawing a snowman. This prompted the sharing of the “Drawastickman” link by Carole (@Coach_Carole). Never one to pass up an opportunity for playing I opened the link and App Shared it so that we could play out the story collaboratively by taking control of my desktop and taking turns to complete a stage in the story. This was great fun – working via someone else’s desktop is a huge challenge because of the inevitable lag time. Drawing is particularly hard because of this lag and everyone did a great job as we finished the story. Drawastickman is a nice toy to play with and would be even better if there were a variety of scenarios/themes leading to different stories! This session definitely put me into a holiday mood! Now I have to come up with a good online game for the party next week. We invite you to our Christmas Party on 15th/16th December – come along with virtual “goodies” for the festive table, and if you feel inventive bring a game to share and play. After the party the webinars will be taking a two week break returning on 5th/6th January with the first Serendipity session of 2012! This recorded, session was a look at bookmarking. I recently did a session for my colleagues on this and thought it might be worth sharing more broadly through Fine Focus. My first task was to find out how many of us use bookmarking and which applications we use. It turned out unsurprisingly that most of us use an application to capture our favourite links. We moved on to look at the two applications beginning with Diigo. I moved all my bookmarks to Diigo a few months ago during the uncertainly about the future of Delicious. I shared my screen to look at and talk about how I am currently using Diigo. I find it works well for me and that the opportunity to highlight and sticky note links is useful because I have a lot of links with almost the same tags so seeing a couple of summarising lines really helps. I am just starting to use groups and was delighted that @TracyWatanabe was with us and willing to talk about how she uses groups extensively. 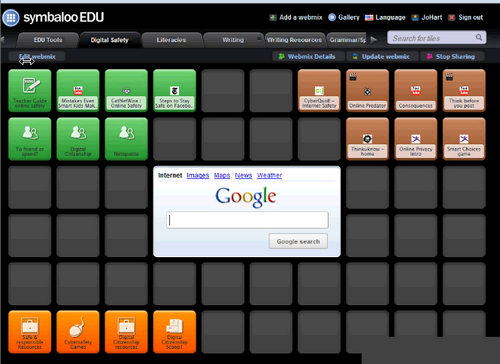 Moving on to discuss Symbaloo was an interesting contrast because Symbaloo is very visual. Again I shared my screen to show how it enables links to be organised, colour coded, categorised symbolically. It doesn’t work in quite the same way as Diigo in that you don’t simply store a link with a click on a toolbar, you have to create a tile and put it in a webmix (category) which is a bit more time consuming. However you can create great visual collections that you can share with others. We finished with a brief look at favourite bookmarking apps and how we use them. I enjoyed doing this session although I felt I that perhaps I should have modified it more – when I talked about bookmarks with my colleagues I was largely talking with an audience who don’t use them so I included the signup. I find the contrast between the two applications is interesting and feel personally that Diigo is the one I will continue to use for most bookmarking but that I will increasingly use Symbaloo for sharing – especially with students because it is so visual! Our next session will be an Edublogs “Serendipity” session on Thursday December 8that 23:00 GMT/UTC (Afternoon/Evening USA) or Friday December 9th at 7am West Aus, mid morning Eastern States Aus depending on your timezone (check yours here) – in the usual BlackboardCollaborate room. This is one of our fortnightly unconference sessions where we invite you to bring along your “hot topics” and “burning issues” for our poll on the topic.